There is nothing I love more than some relaxing online retail therapy. Nothing beats jamming out to some music at home while perusing the web for some new digs in the comfort of my own home. With that being said, I must tell you all about my new obsession, Lyst. I have had my eye on this website for quite some time now, so I decided to check it out and of course instantly became addicted. The site allows you to easily browse clothing by their endless list of brands and designers, with a detailed search toolbar allowing you to find exactly what you want. Also after using Lyst for a bit, your clothing feed becomes personalized to your specific taste and style. 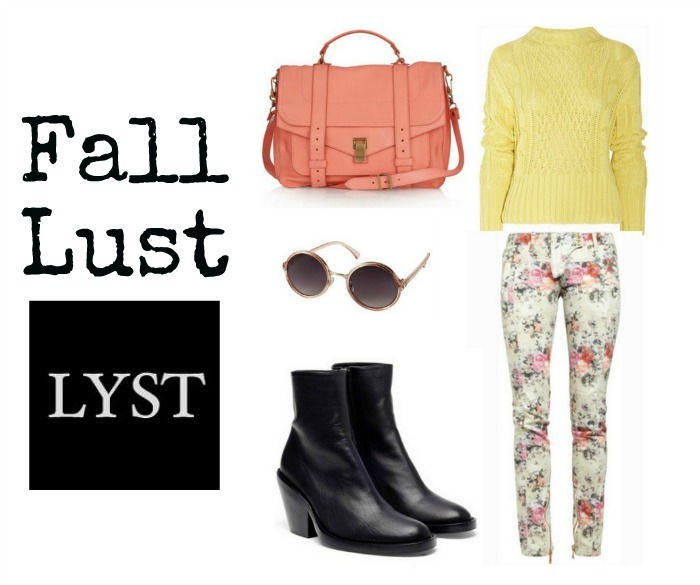 Which of course is how my Fall lust lyst came to life below. And above all, you get instant sale alerts about the items on your Lyst. I have basically been having a blast dreaming and planning my Fall wardrobe. Check out my Lyst profile here and tell me what you think about my picks! I am quite positive that you will become just as addicted as I am. Love what you picked out here. Love the bag & pants. greta selection! but its all so expensive!--definitely within my range right now lol but im loving those floral pants & that bag! I happen to be on Lyst too! It can be overwhelming sometimes with all of those online clothes websites available - but I'll be sure to go on it more often. Favorite thing is being in my cozy house online shopping.